Katy Perry has finally given us a visual for “Dark Horse,” her third single off her album Prism. The new cover is completely different from her past work. Yippee! Katy Perry has just released the official artwork for “Dark Horse,” her third single off her latest record, Prism, and it is bee-oo-tee-fool. Seriously, it’s gorgeous. No, for real — it’s great. Prepare to be amazed, people! Ta-dah! We like that Perry has departed from photography, opting to dive right into illustration. 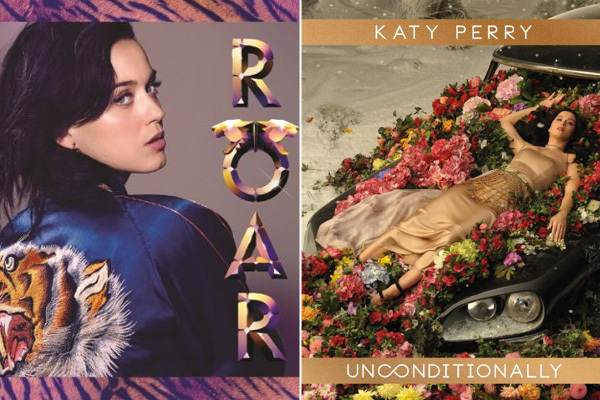 Her depiction, the ornamental detailing and subtle symbolism are very refreshing, especially if you compare it to the covers of her first two singles from the album, “Roar” (below left) and “Unconditionally” (right). “Dark Horse” was released in December 2013 and has been receiving quite a bit of praise for its dark (how fitting, eh?) and raw tones. It’s completely different from Perry’s usual sound, which works for this record. Prism has placed 14th on the list of bestselling albums of last year, which is not too shabby. Critics have also applauded Perry’s evolution as an artist and the mature qualities her new record has adopted. But enough of this chatter! We’re obviously including the single below, so take a listen, and put those visuals to use. What do you think of the cover?